When it comes to the subject of former Alaska Gov. Sarah Palin, Matt Lewis has been ahead of the curve. He suggested that Sen. John McCain consider her as his running mate at a time when she had little national name recognition. Prescience. This book is the most honest and objective depiction of Mrs. Palin yet published because it records her own words, directly and accurately, instead of with embellishments and mischaracterizations routinely served up by the agenda-driven media. Besides, what better way to answer the insults and charges against Mrs. Palin than to consult her own words. Even better, many of these quotes, which address a wide range of political and cultural issues, are extracted from unscripted moments, so we get a real glimpse into Mrs. Palin’s thoughts, absent any editorial airbrushing or blurring. 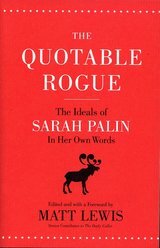 This book is anything but laborious; it’s a quick and entertaining read, and it confirms that Mrs. Palin is plainspoken, consistent and reliably conservative. Her words resonate with a broad spectrum of Americans - not just hard-core conservatives - because she speaks in a language we understand and addresses our concerns. She distrusts big government and is passionate about America’s unique liberty tradition. And she’s unafraid to speak her mind no matter how politically incorrect her opinions are. This is not to deny that Mrs. Palin is a polarizing figure, evoking the antipathy and irrationality of the left like few others, for whatever reasons. Mr. Lewis, fully aware of this, allows Mrs. Palin to speak for herself, trusting that many readers’ perceptions of her will be changed favorably as a result. I think Mr. Lewis also hopes to expose the media’s fabrication of a number of “Palinisms” that were designed to put her in an unfavorable light but, in the end, were malicious distortions. One of the most famous of these, you will recall, courtesy of Tina Fey on “Saturday Night Live,” was, “I can see Russia from my house.” Mrs. Palin’s actual words were, “They’re our next-door neighbors, and you can actually see Russia from land here in Alaska, from an island in Alaska.” The truth doesn’t make her sound ridiculous, does it? Nor does it fit the liberal-media template. Sadly, too many buy into the coordinated media message that Mrs. Palin is an inexperienced lightweight unfit for municipal government service, much less national office. In addition, according to the carefully orchestrated conventional wisdom, Mrs. Palin is a perpetual-motion gaffe machine who is not only uncurious and uninformed but painfully awkward and, frankly, little more than an attractive but annoying hayseed. It’s interesting, isn’t it, that if she were all those things, the media would be so utterly threatened by her? But they are - because she’s none of those things. She ignites conservatives as only a handful of political figures have in the past generation. Far from being inarticulate, she has an uncanny ability to get to the heart of a subject and articulate the mainstream conservative position on it, as this book makes clear. For one so allegedly bereft of gravitas, she has mastered social media, regularly penning and publishing powerful messages that go viral on Facebook and Twitter, precisely because they so succinctly and effectively capture the essence of what grass-roots conservatives believe. She addresses their concerns like few others. I believe, and my hunch is that Matt Lewis believes, that much of the negative reaction to Sarah Palin is based far more on the media and liberal establishment’s systematic savaging of her character than anything she has said or done. They fear any effective, popular, influential conservative, especially those who happen to be female or black, and generally make a point - consciously or not - of trying to destroy them. Regardless of your feelings about Mrs. Palin, it’s undeniable that she consistently demonstrates courage and leadership; she has an uncanny knack for anticipating the next important issue and is unafraid to express her opinion without first holding her finger in the wind to assess its political popularity. In the face of relentless attacks, she doesn’t cower or retreat but fights back and demonstrates her resilience in direct proportion to the assaults against her.